Baulta from Finland will bring their post-rock / post-metal tunes to the festival for the first time. They started out in 2008-2009 and in the meantime they were already nominated multiple times for album of the year by specialized media. A short listening session (or better: a long listening session) to their recorded work will tell you that this is going to be a wonderful experience delivering nice post-rock build ups exploding into post-metal climaxes. Can’t go wrong! Coastlands from Oregon, USA was there at dunk!USA in Vermont in 2017 and, as expected, they made an impression! After releasing To Be Found on dunk!records early 2017 they also released The Further Still on double colored vinyl through dunk!records in November 2018 which already sold out. Their loud and intense ‘instrumental sad-rock’ will definitely translate well onto our main stage. 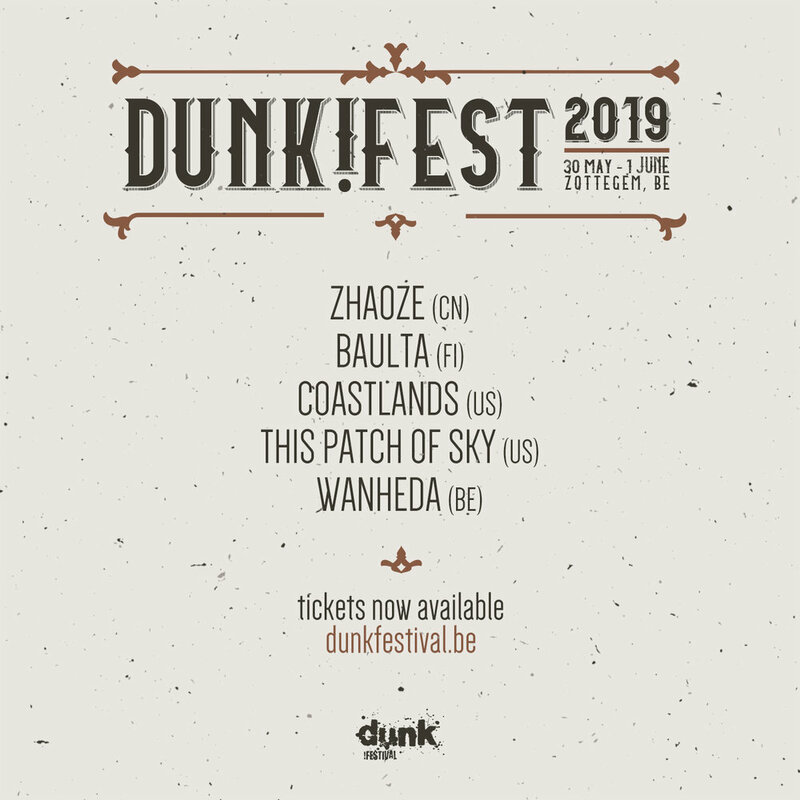 This Patch of Sky is also from Oregon, also played dunk!USA 2017 and will also be there at dunk!festival 2019. So far the similarities to the previous band. Their latest album These Small Spaces on dunk!records was released on dunk!records (EU) in September 2017 (wait, that’s another thing they have in common). After dunk!USA we kept listening to this album with its enchanting cello parts and we couldn’t be happier to finally have them on the line-up for dunk!festival. We know for sure this is going to be one of those moments of this years edition. WANHEDA from Belgium will open the forest stage on day 2. “This is a classic Dunk! band who have a bunch of excellent tunes as business cards." — Merchants of Air. We didn’t realize we were already a genre tag but nevertheless we trust this quote and booked these guys for our 15th edition. Oh, and their tunes are definitely worth checking out. Preferably live, at the end of May in the area of East Flanders, if possible in a forest.